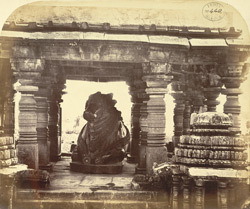 Photograph of the large Nandi in the mandapa of the Hoysalesvara Temple at Halebid from the Archaeological Survey of India Collections: India Office Series (volume 24: 'a' numbers), take by Henry Dixon in the1860s. This temple dates from the mid-12th century and represents the climax of the Hoysala style. The complex is sacred to Nataraja, the dancing Shiva and consists of two identical temples with sanctuaries and two pillared halls or mandapas built on a stepped plan. The superstructures are no longer standing. In front of each mandapas there is a Nandi pavilion with lathe-turned columns. This view shows the largest pavilion with a huge Nandi, the white bull sacred to Siva adorned with bells and chains. The temple is renowned for its extraordinary profusion of sculptural ornamentation.